When freight-rail executives and advocates meet in Washington, D.C., for the annual Railroad Day on Capitol Hill on March 7, they will come armed with a wish list for Congress and President Donald Trump's administration to consider when it comes to policies, legislation and regulations that impact the railroad industry. 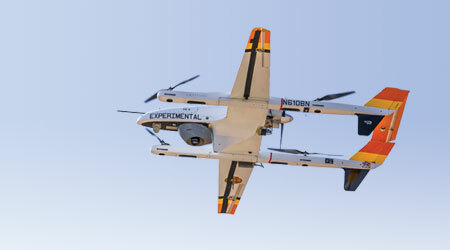 Some of their wish-list items are perennial favorites: passing a permanent extension of the Section 45G tax credit for short lines; maintaining existing truck-size and weight restrictions; shoring up the federal Highway Trust Fund; and squelching the Surface Transportation Board’s (STB) proposed “competitive switching” rules. 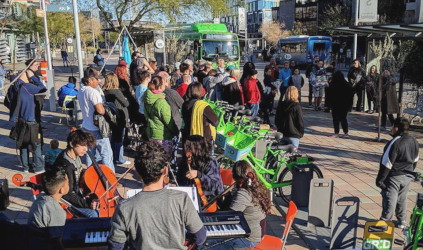 All of those topics will be emphasized in conversations with lawmakers, their staff and U.S. Department of Transportation officials. Also top of mind will be President Trump's long-awaited infrastructure plan, which as of press time was expected to be unveiled shortly after his Jan. 30 State of the Union address. According to news reports, Trump said he expects to unveil a package that will work to "rebuild our crumbling infrastructure" by stimulating a $1.5 trillion investment. His announcement followed last month’s news leak of what might be contained in the package. Last year, as part of a budget proposal, the president called for a $1 trillion infrastructure investment that would include some federal monies but also encourage more investment by states, local communities and the private sector. Whatever ends up in the package, rail association leaders say they'll advocate for rail projects to have priority in funding programs. They also want increased federal funding for Amtrak, as well as additional federal dollars for commuter-rail agencies to complete positive train control (PTC) implementation. "We are very concerned about modal parity," says Nicole Brewin, vice president of government affairs for the Railway Supply Institute (RSI). "We are concerned that rail should have a bite of the apple, so to speak." Perhaps the newest and most urgent policy issue industry execs will take up with politicians and their aides will be the renegotiations of the North American Free Trade Agreement (NAFTA). Round six of the NAFTA renegotiations started Jan. 23 in Canada. Trump has continued to repeat his threat that the United States will withdraw from NAFTA if he doesn’t like the new pact. Rail associations in the United States, Canada and Mexico recently wrote an open letter asking trade policymakers and NAFTA negotiators to declare the industry’s support for renewing the agreement. They also asked negotiators to keep in mind the impact railroads have on trade and vice versa. "Economic growth tied to NAFTA has allowed railways to invest tens of billions of dollars into their infrastructure while improving productivity and customer service, and fostering innovation," stated the letter, issued Jan. 22. "Collectively, these improvements have enabled railways to maintain the low rates that are required to provide shippers with access to global supply chains to support their success." NAFTA — which went into effect Jan. 1, 1994 — has helped develop an integrated economy in which a continental rail network is essential for the flow of goods across North America. From 1993 to 2016, the value of trade between the United States and Canada rose 157 percent to $544.6 billion, according to the letter. Over that same period, U.S.-Mexico trade jumped 543 percent to $523.8 billion and Canada-Mexico trade soared 776 percent to $30.8 billion. The letter was signed by Edward Hamberger, president and chief executive officer of the Association of American Railroads (AAR); Gerald Gauthier, acting president and CEO of the Railway Association of Canada; and Iker de Luisa Plazas, director general of the Asociacion Mexicana de Ferrocarriles. About 42 percent of rail carloads and 35 percent of rail revenue are directly associated with international trade, according to AAR. "Hopefully, that message is getting through to the administration," Hamberger says. "We're not saying NAFTA can't be updated; there will be changes in it. But you can't just withdraw from it." One sticking point in the negotiations — which would directly affect auto manufacturing and freight railroads — is the rules governing country of origin for automobiles. Specifically, the Trump administration wants to "dramatically" increase the amount of content from NAFTA nations in autos to 85 percent from 62.5 percent, according to a November 2017 editorial posted on foxnews.com by Hamberger and Alliance of Automobile Manufacturers President and CEO Mitch Bainwol. Under the proposal, a total of 50 percent of the total content would have to come from companies in the United States, Hamberger and Bainwol wrote. "The Trump administration is seeking this change despite the fact that 12.2 million vehicles were produced in the U.S. last year — over 1 million more than were produced in our country in the year before NAFTA went into effect. And vehicles produced in Mexico and Canada already have substantially more U.S. content than those produced outside the NAFTA region," their editorial stated. Much of that traffic currently moves by rail. The administration’s proposed formula could interrupt the supply chain and make it more difficult for vehicles and parts to move within the United States or between Mexico and Canada duty-free, they added. The dispute over the proposed change could lead to NAFTA’s termination. "What we are emphasizing is that NAFTA is over 20 years old, so it's natural to take a look at it and make improvements," says RSI President Mike O'Malley. 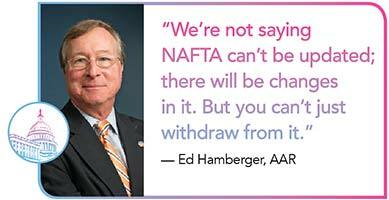 "But what we're [also] emphasizing is that it's important [for NAFTA negotiators] not to put impediments in the supply chain that would add costs not only for our members, but for the people who are buying the goods." Section 45G of the IRS Tax Code is at the center of the American Short Line and Regional Railroad Association’s (ASLRRA) policy agenda. A proposal to extend the credit is now part of tax extender legislation before Congress. Expired since Dec. 31, 2016, the short-line credit would be extended to Dec. 31, 2018. 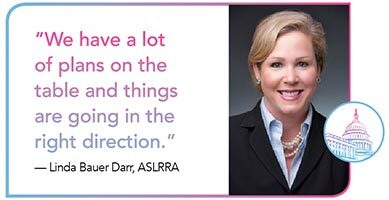 Even if the two-year extension occurs, the association will continue advocating for a long-term or permanent extension, says ASLRRA President Linda Bauer Darr. "We are continuing to press for a 10-year deal and will continue to look for every opportunity we can to see that that happens," she says. Class Is benefited from the recently passed Tax Cuts and Jobs Act, which cut corporate taxes, RSI’s O'Malley notes. Short lines could use some help, as well, he adds. "It's fair to say the tax reform bill will be helpful in supporting the Class Is as they make decisions about making investments in their networks," says O’Malley. "For the short lines, the 45G tax credit will help them invest in smaller projects in congressional districts across the country." Rail-industry associations along with the Coalition Against Bigger Trucks (CABT) will continue to fight the trucking industry's attempts to gain looser federal restrictions on the size and weight of trucks allowed on interstate highways. One trucking industry proposal is calling for expanding the length restriction on double trailers from the current 28 feet to 33 feet. "Our biggest concern [with the truck-size and weight issue] is the size and shape of the opposition," says ASLRRA's Darr. "As we see companies like Amazon coming on board and aligning themselves with FedEx, UPS and others, it becomes an even larger challenge to hold our ground on what is an existential threat to our industry," she says. For example, if the restrictions are changed to allow twin 33-foot trailers, "that gets into the carload market, which we believe would result in a significant amount of freight diversion from the rail to the road," says Darr. In 2017, CABT and rail groups succeeded in blocking attempts in Congress to pass truck size or weight increases. This year will present new challenges, says RSI's Brewin. The congressional appropriations process will be a never-ending threat, since appropriations bills have become primary vehicles for bigger-truck proponents to advance their proposals, she says. "We also have to be very cognizant of what might happen [when] there’s an infrastructure package," Brewin adds. Building on the truck-size and weight topic is the Highway Trust Fund's (HTF) solvency, say AAR officials. Funded by the federal tax on gasoline and diesel fuel, the HTF is used to pay for surface transportation improvements, including at transit-rail agencies. But Congress hasn’t raised the tax since 1993 and the fund hasn’t kept pace with the cost to maintain and repair crumbling infrastructure. As a result, Congress has paid the bill out of general revenue to the tune of about $143 billion since 2008, according to AAR. That $143 billion partly is a subsidy to the trucking industry, which doesn’t cover the cost of infrastructure damage caused by heavy trucks, according to AAR. On the other hand, freight railroads invest a combined $25 billion a year in their own infrastructure networks, says AAR Senior Vice President of Government Affairs Ian Jefferies. "We think our competition should have to pay their way as well," Jefferies adds. "That will be a central piece of Railroad Day on the Hill." Likewise, AAR will stress finding new ways to bolster the trust fund’s revenue sources, whether that's through raising the gas tax or instituting tolls or new fees based on vehicle miles traveled. "All of those options should be on the table to get the Highway Trust Fund to solvency," says Hamberger. AAR and other rail-industry representatives say they've appreciated the Trump administration’s approach to regulations, such as the U.S. Department of Transportation’s repeal late last year of a Federal Railroad Administration rulemaking that would have required the installation of electronically controlled pneumatic brakes on certain tank cars. The administration’s call for streamlining the infrastructure project approval process also has been a welcome sign, they say. Still, industry executives remain concerned about proposed regulations before the STB that they believe would discourage railroad investments. At the top of the "most concerned" list is the STB’s notice of proposed rulemaking that would require "competitive access" or reciprocal switching. Favored by shippers, the regulation would require railroads to surrender their privately owned property for use by competing railroads, says Sean Winkler, director of advocacy at the Railway Engineering-Maintenance Suppliers Association. Although the shipping industry believes the proposal would help increase price competition, rail industry advocates say it would add to their costs and thus discourage sustained investments in rail-system maintenance, according to Winkler. Also on the industry's radar is how the STB defines "revenue adequacy" for Class Is, a concept that describes whether a railroad is earning enough revenue to cover its costs and earn a return that’s sufficient to attract capital. Some STB rulemaking decisions have been on hold until additional board members are nominated and seated. The board is authorized to have five members, but currently there are two — Acting Chair Ann Begeman and Vice Chair Deb Miller. Rail advocates are hoping the vacancies will be filled by nominees with direct rail-industry experience, says Winkler. Although industry leaders are pleased Trump has made rebuilding infrastructure a priority, they’re concerned about the ability of Congress to pass anything really big given the partisan divide. Moreover, passage could be a challenge if an infrastructure bill calls for an increase in federal spending so soon after Congress passed $1.5 trillion in tax cuts. 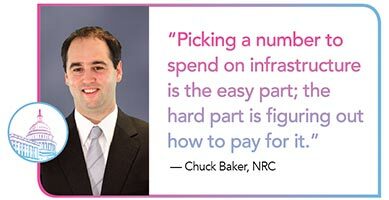 "Picking a number to spend on infrastructure is the easy part; the hard part is figuring out how to pay for it," says Chuck Baker, president of the National Railroad Construction and Maintenance Association (NRC). Baker sees the funding discussion possibly centering on increasing the federal gas tax; implementing a miles-traveled tax on commercial vehicles; cutting spending on discretionary domestic programs; or borrowing. Or, a combination of all those things. Baker is in the "hopeful but not optimistic" camp when it comes to Congress finding agreement on a big package that "spends real money and in any way moves the dial on infrastructure," he says. However, he can see Congress passing a smaller bill that calls for regulatory reforms, shortens the environmental permitting process and fixes financing programs for infrastructure projects. 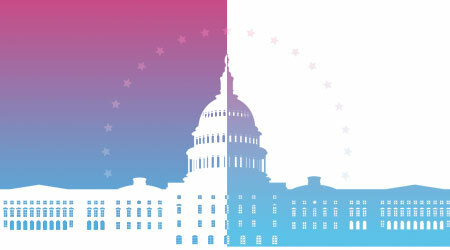 On NRC's wish list for an infrastructure package: grant programs for freight-rail projects; a long-term extension of 45G; truck size and weight restrictions; grant programs for transit and intercity passenger rail; and improvements to the Railroad Rehabilitation and Improvement Financing program, such as a subsidy for the credit risk premium, shorter processing times, and a clearer and simpler process for loan applicants. Although some rail industry execs question whether a bill will pass, they say they're encouraged by last year's economic growth, as well as with Trump's emphasis on infrastructure and regulatory reform. Given all that, ASLRRA's Darr says she's "fired up" for this year's Railroad Day on Capitol Hill. "We just finished a strategic plan, and we're talking about how to use technology and data to get more efficient at serving our customers and growing our carload traffic," she says. "We have a lot of plans on the table and things are going in the right direction. So, I think we feel upbeat, positive — beyond good."